Just as the U.S. economy stalled in the second quarter of the year, so did restaurant industry traffic, according to The NPD Group. NPD’s foodservice market research shows that visits to U.S. restaurants slipped by 0.4 percent in the second quarter (April, May, June) compared to same time year ago bringing the industry recovery that began in the third quarter of 2010 to a halt. 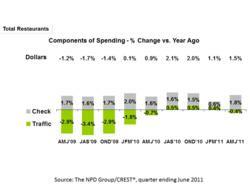 Consumers spent 1.5 percent more at restaurants in spring 2011 than they did in spring 2010. Unlike the three prior quarters, the increase traced solely to higher checks, as traffic contracted slightly. Have you been visiting restaurants less since the recession started?